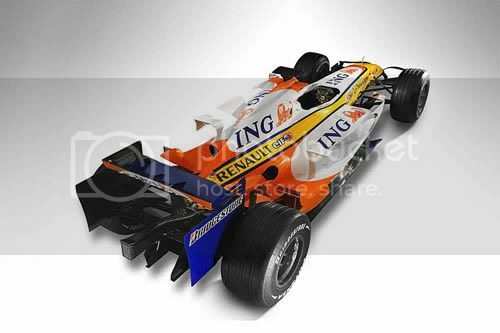 Now for the car that's probably been the most eagerly awaited, the Adrian Newey-designed RB3. I admire Newey, if for no other reason than he's probably the only car designer to actually use a drafting table. It's certainly more 'swoopy' than last year's RB2, particularly in the sidepods, but that's a Newey trademark. Amazingly, RedBull has the best wind-tunnel in the sport, so one would expect it to be cutting edge in the aerodynamic areas. Throw in the Renault-built engine, and the RB3 should be a substantial improvement over last year's car. Indeed, the leap should be quite large, from 'best of the backmarkers' to, perhaps, high mid-pack... certainly the equal of Williams, perhaps as good as BMW-Sauber, and at the outside, Honda-level? The front drop in the wing seems lower than the Honda's, and better curved to boot. Unlike the McLaren, the air intakes seem LARGER than last year's car... which makes sense, actually, considering the overheating problems they had. That rear wing sidepanel is quite interestingly shaped. It must be for aerodynamic reasons, but those cutouts at the back of the panel are... odd. 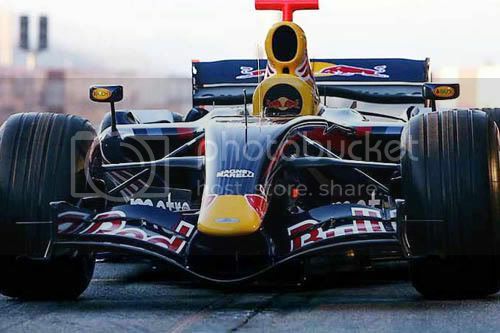 The front wing sidepanels have that mini-winglet (now THAT'S small!) that's become all the rage in F1 circles. Note that the air intake 'hump' is even more brutally shaped than the gargantuan thing on the McLaren. More aerodynamics, or more cooling? Alas, there weren't any studio shots taken; it was a low-key rollout, really. 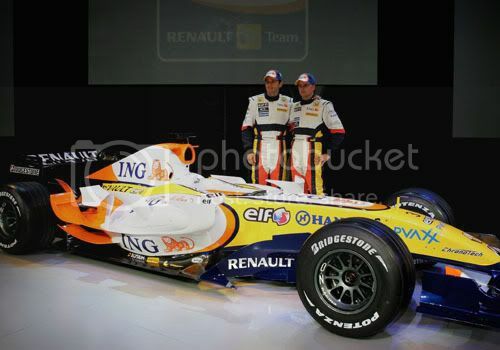 In contrast to that, though, was the Renault debut a few days ago. Now that a little time has passed, I've been able to dig up better photos of the R27, and for comparison, similar shots of the R26. I'll be posting that on Saturday, so wait with bated breath until then! 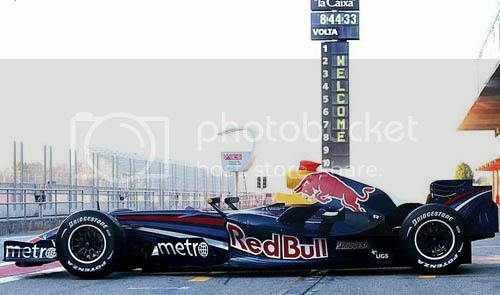 1 Great looking Red Bull car. It almost looks like the bull is riding along. Okay, this is disappointing. Two rollouts in two days, and LOUSY photographs. I'm sorry, but it looks like someone with food poisoning painted this... with their lunch. Simply put, I can't tell what's changed on the new Renault, because there aren't any "studio portraits" that I can find. While I really like the all-black livery, I also know that it's not going to last. Honda is going to have a 'paintjob party' in about a month, if you would believe it. The black also makes it difficult to see the changes. For what it's worth, the Honda died on-track about a minute into it's first test. Oops. 1 Words fail me for the Renault. It looks like it had a nasty accident with an 80s era Mclaren. 2 UGH!!!!! That paint job is beyond ugly, but you'll probably be able to spot it on the track rather easily. All the old-timers have come back to the nest!!! ...yeah, that's about it. Haven't found ANY good pictures of the new car, and the ones I HAVE seen pretty much point out that it's not worth the effort. Seriously. It looks identical to last year's car, save for (say it with me) a raised nose with endplates on the wings, smaller air intakes, yadda yadda yadda. I have great hope for the team, and fully expect Robert Kubica to do well in the car this year, but it sure LOOKS dull. 1 The side pod cooling ducts seems a little smaller. Also that litte front ram vent is on the the MP4-21 as well. They must jam something up in the nose that gets warm. They also have the bigger rearwing endplates we see on the other two cars. 2 What's with the "humpback"? Not a very "graceful" line. 3 The side pods looking smaller is mostly a function of the picture being taken farther off-center. OTOH, they do look a bit narrower and taller. They also look they're raked back kinda like the intakes on an F-15. At least more so than last year's edition. The humpback probably has a better Cd than the previous version, particularly if it tapers down on the sides more gradually compared to the old car. 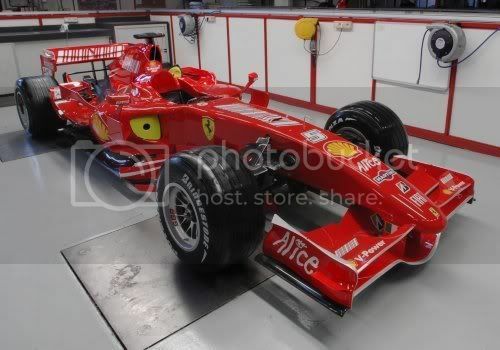 Remember when I said that Ferrari was having the debut of their car on Sunday, but the car wasn't going to be ready? Unlike Toyota, Ferrari hasn't made any obvious changes to the bodywork, mostly because last year's 2-4-8 was pretty well-developed. 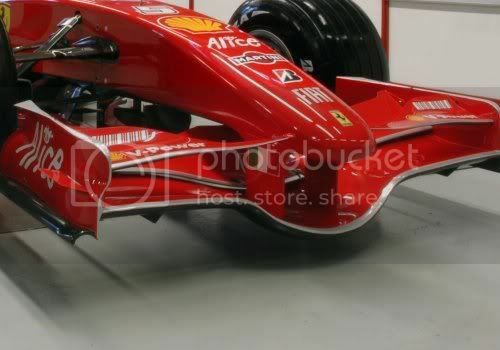 Really, the biggest change isn't visible in the photos released by Ferrari: the wheelbase is a little longer, and the rear is a little narrower. Another big change is the disappearance of the Vodaphone logo, which to my eyes is like the '80s McLaren cars missing the Marlboro logo. It just doesn't LOOK right... and I just realized that I'm analyzing the paintjob of the car. What is WRONG with me? More pr0n! Also missing from the car, obviously, is Mitchell Schumacher, aka 'Slappy,' aka 'Parky.' I wonder if that's going to be a killer or not. Oh. Almost forgot. 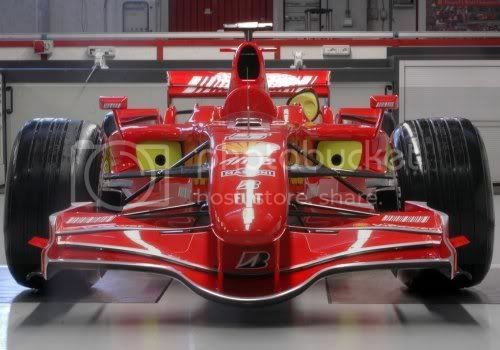 Last year, Ferrari went back to their 'classic' numbering style, calling their 2006 car the '2-4-8.' This year? Back to their new style: this is the F2007. Woo-yay. Monday is the scheduled debut of the McLaren challenger... and The Pond will be there! Er... not really, but we'll be HERE, with the pictures FROM there. See you then! Post contains 205 words, total size 2 kb. 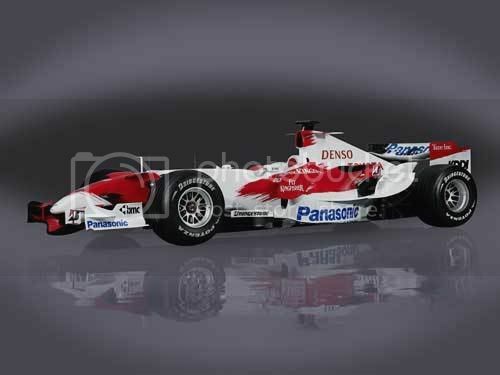 Ladies and Gentlemen, the Toyota F107! 25kb generated in CPU 0.03, elapsed 0.1497 seconds. 47 queries taking 0.1265 seconds, 126 records returned.